Associate Professor, Ph.D., Eng. Piotr Szynkarczyk is Director of the Industrial Research Institute for Automation and Measurements (PIAP) and co-inventor of the first Polish pyrotechnic robots “Inspector” and “Expert” used in Poland and abroad. He has authored and co-authored 12 patent applications and over 70 scientific and technical papers published by Polish and foreign publishing houses. Piotr Szynkarczyk is an Associate Professor (2012) and a graduate of the University of Łódź, the Faculty of Management of the Polish-American Studies in commercialization of innovative projects and new technologies (under the licence of the Institute of the University of Texas at Austin, USA, 2010). He holds a Ph.D. in technical sciences (2000). He is also a graduate of the Warsaw University of Technology and Faculty of Power and Aeronautical Engineering (1992). Piotr Szynkarczyk’s personal interests revolve around mobile robotics, artificial intelligence in robotics, controlling autonomous systems using biologically inspired distributed controllers, long-distance teleoperation, and artificial neural networks. Currently, Piotr Szynkarczyk manages a team of nearly 300 people who have a successful track record in automation and robotics R&D. He also pursues analytical and expert activities regarding the use of UAVs for military applications and mobile robots for civil applications. 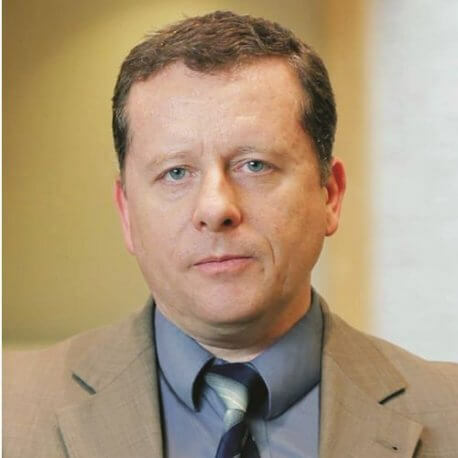 He is a highly regarded expert and a member of the Committee of the Automation and Robotics of the Polish Academy of Sciences, the Main Council of Research Institutes, and the International Association for Automation and Robotics in Construction. He has been awarded the Order of Polonia Restituta (Order of Rebirth of Poland) (2016), Gold Medal of Merit for National Defence presented by the Minister of National Defence (2015), and Bronze Cross of Merit presented by the President of the Republic of Poland (2005). Privately, an enthusiast of astronomy and a licensed ham radio operator.